Bangalore is the capital of the Indian state of Karnataka. Located on the Deccan Plateau in the south-eastern part of Karnataka, Bangalore is India’s third most populous city and fifth-most populous urban agglomeration. That the motorists in Bangalore don’t seem to care for pedestrians has been a subject of intense debate for long. The debate has been set to rest by a New Delhi-based green group’s report that statistically shows Bangalore’s deficiency in this category. 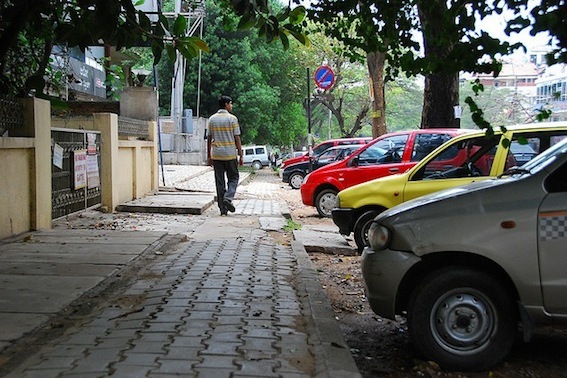 Among the seven Indian cities surveyed, Bangalore scores the lowest – a measly 30 out of 100 – in the ‘motorist behaviour’ category, one of the nine parameters considered to determine the walkability (walking infrastructure availability) of a city. The survey was initially conducted in 13 Asian cites and later extended to seven Indian cities – Bangalore, Chennai, Pune, Bhubaneswar, Indore, Rajkot and Surat. The survey’s objective is to rate the Indian cities on walkability parameters and to inform policymakers and stakeholders on the changes required. Bangalore’s low score implies that vehicles seldom stop for pedestrians to cross a road and often halt on the zebra crossing at signals leaving pedestrians with minimum or no space to cross a road. At times, vehicles are driven on the footpaths, robbing the pedestrians of their exclusive zone. More worrying is that the areas where schools are located, too, fared equally badly. Of the nine parameters set by Clean Air Initiative for Asian Cities, Bangalore individually scored the lowest in the ‘disability infrastructure’ category with a shocking low of 24 against 100. The whole of Asia – and India, in particular – scored very low under the disability infrastructure parameter. This means the differently abled people (visually challenged or wheelchair bound) will find the city roads very unfriendly, with difficulty in moving on the footpaths or even cross roads in the absence of facilities like ramps, lifts or tactile pavements. CAI Asia has conducted a survey on nine parameters considered to determine the Walkability (walking infrastructure availability) of a city. The survey was was carried out in 13 Asian cites and then scaled up to seven Indian cities –Bhubaneshwar , Chennai, Indore , Pune, Rajkot, Surat and Bangalore. The data was generated by field surveys and pedestrian interviews. “With high vehicular speed and wide roads, pedestrians are likely to find themselves at a terrible disadvantage and certainly marginalized,” said Sameera Kumar Ananthpur, transport researcher, CAI Asia. For instance , the Airport Road to Devanahalli is a death trap for pedestrians, where six to eight lanes cross and vehicles moving at 60 to 100 kmph. Add to that no median refuge and poor lighting. “Unfortunately , city planners don’t seem to realize this and continue to cater to motorists who are a minority. Every year Bangalore sees over 900 road accident deaths and close to 50% are pedestrians and cyclists and alarmingly this percentage is on the rise. The question cities need to ask themselves here is: for whom is the city being built and is the city livable,” the study notes. The survey states that pedestrian policy paper and the Bangalore comprehensive traffic and transportation study envisions a pedestrian mode share target of only 20% by 2025, against the 80% share of motorists on the city roads. This disregard for pedestrians is so endemic that near to where I reside, 18″ high concrete medians were poured, and right across 3 zebra crossing. My resistance and reasoning was met with stoic indifference as the contractor is paid by the running feet of medians he installs. This eventually rendered the entire zebra crossing useless. And this is a place where several elderly people cross to visit a Ramakrishna mission nearby.